In today’s fast-moving consumer goods environment, consumers demand an increasing degree of differentiation. Serving this need comes at a cost. Think about your favorite beverage, for example. Many years ago, that beverage may have been available in just one flavor, with one packaging option. Today, it’s probably available in a multitude of flavors, with sugar-free options, and in cans and bottles of various sizes. Meanwhile, shipping protocols for different countries vary, so the way individual bottles and cans are packaged together will be different depending on where the manufacturer is sending the products. These variations are known as stockkeeping units (SKUs), and accommodating them adds significantly to production costs for companies that produce fast-moving consumer goods. Cost accountants have an opportunity to provide significant value by assisting their companies in fulfilling customers’ desire for this customization while minimizing the costs. Allocating the costs of carrying these many SKUs can be a challenge. This cost is often interwoven — or, frankly, “hidden” — in standard rates for raw and packing material, in standard rates for machine hours, and more-or-less granular allocation of overheads. Making these costs visible and relevant to decision-makers, who need to balance variety and complexity, is a valuable contribution by cost accountants looking to maximize value for their company. Let me introduce a case of toothpaste in a European factory. While the framework presented here is a real-life case, the data in this article are randomized to protect confidentiality. Assume there are 10 types of toothpaste providing specific benefits such as whitening, gum care, anti-cavity, etc. Those products are delivered to nine countries with different language and regulatory requirements and sometimes even country-specific branding. The products are put in six different-size tubes, which come with wide or small and white or colored closing caps. In some cases, they are packed in glossy carton boxes and — depending on the primary trading partners in a country, such as hypermarkets or grocery stores — packed in batches of six, 12, 24, or 36 into SKU-specific shippers. The annual output is about 1 million total tubes, packaged in 100 different SKUs. The management accountant can provide value to the company by determining the demand and the cost for each SKU and communicating it to decision-makers so they can create the portfolio of SKUs that they wish to produce. In many cases the SKU portfolio will be decided by a manager owning a P&L, so key measures would be sales and profit. Hard-wiring the cost of complexity visibly to this P&L will provide valuable information to decision-makers who want to offer a maximum of SKUs to consumers (maximizing variety) and those that want to minimize operation cost (minimize complexity). The work of costing for complexity must go beyond abstract size-of-prize presentations but directly impact the relevant scorecards, for example, by adjusting the standard costs or transfer prices in an organization with P&L accountability. Here’s one way to meet the challenge of communicating the relevant impact to the P&L. Almost all standardized costing systems have fields for material costs and machine hour rates. Often there is an extra field to add or subtract costs specific to an SKU like the “additive cost” field in SAP or other enterprise resource planning systems. I want to use just this field to account for the cost of complexity and not touch any well-established costing fields because changing all of this is probably too complex and time-consuming for driving tangible actions now. 1. We need to establish the actual cost of carrying an SKU. What would be the efforts saved if a factory was producing only a single SKU? There would be no SKU change-overs and no scrap for having put the wrong variety of toothpaste in a tube carton or shipper. There would be much less work for the planning department scheduling production and material handling, much less work for costing all of this — here the cost accountant takes a personal risk — and many more cost benefits. The cost of complexity of the operations can be determined by asking a few experienced managers how the operations would look if today’s total production volume was achieved by just one SKU and comparing the status to the current reality. Taking it one step further, one could also include the commercial cost of only selling and advertising one SKU. But let’s focus on product costing for now. 2. Divide the total cost of complexity by the number of SKUs today. This assigns the same cost to any SKU. Additional SKUs are treated the same as existing SKUs, which allows for reviewing the established portfolio without creating a barrier to introduce new, innovative products. It simplifies the communication of the cost of complexity by giving it a price tag. 3. This cost of complexity per SKU is subtracted from every SKU’s standard cost. We then define complexity as the “volume per SKU.” The production volume used here should be consistent with the volume assumptions used for the regular standard-setting process and eventually annualized to account for new launches within the costing period. 4. Divide the “cost of complexity per SKU” by the specific annualized volume for each SKU. This cost will be added back to each SKU’s standard cost. SKUs that have a below-average volume will see a net increase in cost, as the cost reduction from the third step is lower than the addition in this fourth step. SKUs with above-average volume per SKU will enjoy a net decrease in cost. This net cost impact is then added to the costing field mentioned above. 5. Very low-volume SKUs can receive a very large upcharge in cost. Especially in the context of transfer pricing across customs and tax jurisdictions, you may want to limit or “cap” the net effect. In such case, the residual of complexity cost will need to be reallocated to the higher-volume SKUs. Back in the toothpaste factory, the review with a group of experts revealed that about $2 million would be saved if the plant’s output of 1 million tubes was achieved by one SKU only. Hence, the cost of complexity was $20,000 per SKU (this is the easy-to-understand price tag). In the third step, all SKUs enjoy a $2 reduction in cost driven by allocating the total cost of complexity of $2 million over 1 million tubes. The add-back in the fourth step varies by volume of each specific SKU. In our example, the lowest-volume SKU is an Oral Health 200ml tube with a wide cap in a box in a 12-count shipper for Turkey with a volume of only 1,104 tubes, leading to an add-back of about $18 per tube. On the other hand, the highest-volume SKU, a Multi-Benefit 125ml tube with a colored wide cap without a box in a six-count shipper for Germany with a volume of 38,148 tubes enjoys a net benefit of -$1.48 per tube from the cost of complexity reallocation. Suppose that there was a need to limit the complexity upcharge by a “cap” of $2.50; the upcharge for the lowest-volume tube would obviously be only $2.50. That’s a big reduction from the original $18 upcharge. But due to the large differences in absolute volumes for other SKUs, the $2.50 cap would only impact the down-charge per tube for the highest-volume SKU by about $0.23 (from -$1.48 to -$1.25). There is only a slight impact for SKUs with about average volume. Two Gum Care SKUs for Italy and Germany are slightly below and above the 10,000-tube average and, hence, only receive a small upcharge of $0.06 or a down-charge of -$0.07. Introducing a cap shifts this break-even point slightly toward larger-volume SKUs. Another Gum Care SKU — this time the small size in Germany with a volume of 11,232 tubes — would mark the divide of SKUs receiving an upcharge or down-charge. One noteworthy effect can occur to SKUs with an upcharge slightly below the capped level. Let us look at the UK Sensitive 200ml with a volume of 4,476 tubes. The basic complexity upcharge is $2.47, so this SKU is not captured by the cap of $2.50. However, after reallocating the capped complexity charge to the noncapped SKUs — in our case an upcharge of $0.22 — the adjusted complexity charge jumps to $2.69, above the original cap. This is a watch-out for the cost accountant to eventually add another iteration of cap to ensure that all SKUs finally fall below the intended $2.50 threshold. Now, most important are the actions that such a complexity charge would drive. Given the definition of complexity as volume per SKU, most actions would aim at either (1) pricing for the small-scale differentiation demanded by consumers or (2) lowering the complexity charges by increasing the volume per SKU. Action A: Hungary and Czech Republic both offer a small and a large size all in a 12-count shipper. However, the actual sizes differ by country. Hungary sells 50ml and 100ml tubes while in the Czech Republic tubes are sold in 75ml and 125ml sizes. Both countries share Tartar Control and Gum Care pastes. Both countries combined carry a complexity cost upcharge of $27,480 with more than half of their SKUs receiving an upcharge. What if the sales managers in these two neighboring countries could agree on one common small and one common large size, and share one label with both languages and regulatory information? The number of SKUs is reduced from 12 to seven, and the complexity upcharge flips from an upcharge to a down-charge of -$72,520. This reduction in complexity cost could be reinvested to introduce a large-size anti-gingivitis product missing in today’s portfolio or to introduce new toothpastes into the market like the popular Whitening or Multi-Benefit SKUs. Action B: Italy and Germany share the same sizes for large (125ml) and small (75ml) offerings. However, Germany sells toothpaste without a box due to cost-savings considerations. Can the reduction in complexity cost by combining the SKUs outweigh the cost of adding a box for Germany, at least for the 125ml sizes that also share the same case count? The common large-size execution reduced the complexity charge by $80,000. As long as the cost for the box is below $1.21, this is a payout for the markets. And with this benefit one can even start challenging the different case count for the small size to get the whole SKU portfolio upgraded to one consistently boxed execution. Action C: Turkey sells toothpaste in four sizes. Gum Care and Anti-Cavity both carry a 100ml- and 125ml-size execution. Combining the volume to the standard 100ml size, which is the middle size for all other pastes, reduces the complexity charge by $40,000. In Gum Care the upcharge of $4.51 for the 125ml size and $1.92 for the 100ml size is reduced to only $0.45 after combining the two. The two anti-cavity sizes, with about average volumes each, create one low-complexity SKU with a volume of 21,588 tubes and a complexity down-charge of -$1.07. Action D: Oral Health paste is sold in six countries with an average volume of only 2,883 tubes per SKU. Consumers are willing to pay a premium for this specialty SKU. But it is worthwhile to consider introducing one Europe-wide execution, which reduces the SKU count from 12 to just three. This reduces the complexity charge by $200,000, which in turn can be reinvested in advertising or introducing new innovative SKUs like the Vitamin toothpaste to more markets. These are just four actions triggered by the introduction of the complexity charge. Helping the decision-makers understand the cost of complexity enabled business discussions that optimized the company’s product offerings. The overall cost of complexity was reduced significantly, which in turn affected the complexity charges of subsequent costing cycles. The cost accountant can play a critical role in triggering a discussion of variety vs. complexity. By making it easy to understand how the cost of complexity affects decision-makers’ performance measures such as the P&L, the cost accountant can drive tangible actions to optimize the complexity in the SKU portfolio. The introduction of a cap addresses potential concerns from a tax and customs perspective. 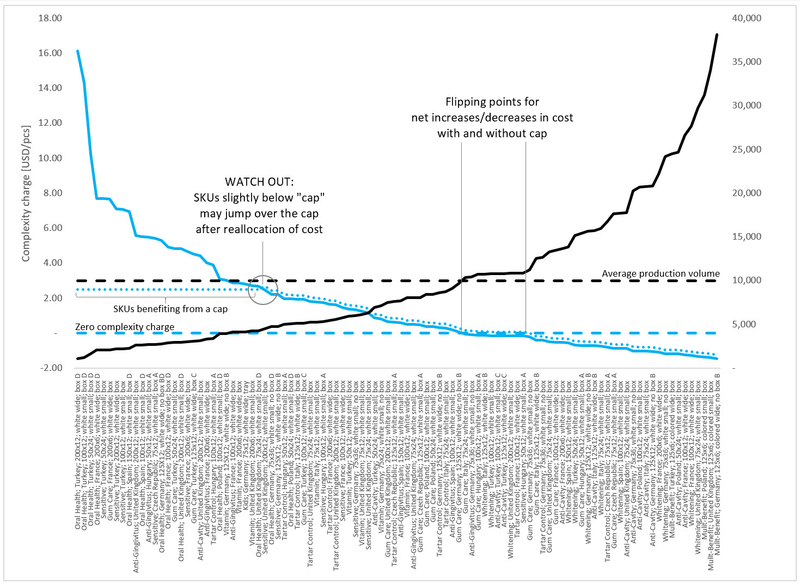 Furthermore, the increased awareness of the cost of complexity provides the basis for delivering more differentiated SKUs — as demanded by consumer needs — at lower cost. Introducing flexible manufacturing systems or late-stage differentiation capabilities will enable an increasingly differentiated SKU portfolio at an affordable manufacturing cost to meet consumer needs in the long term. — Moritz P. Maurus, ACMA, CGMA, is a finance manager for Procter & Gamble in China, where he has worked and lived for more than 10 years. To comment on this article or to suggest an idea for another article, contact Ken Tysiac, the JofA’s editorial director, at Kenneth.Tysiac@aicpa-cima.com.